Right, let’s write a review about hot dogs, without any innuendo…wish me luck. 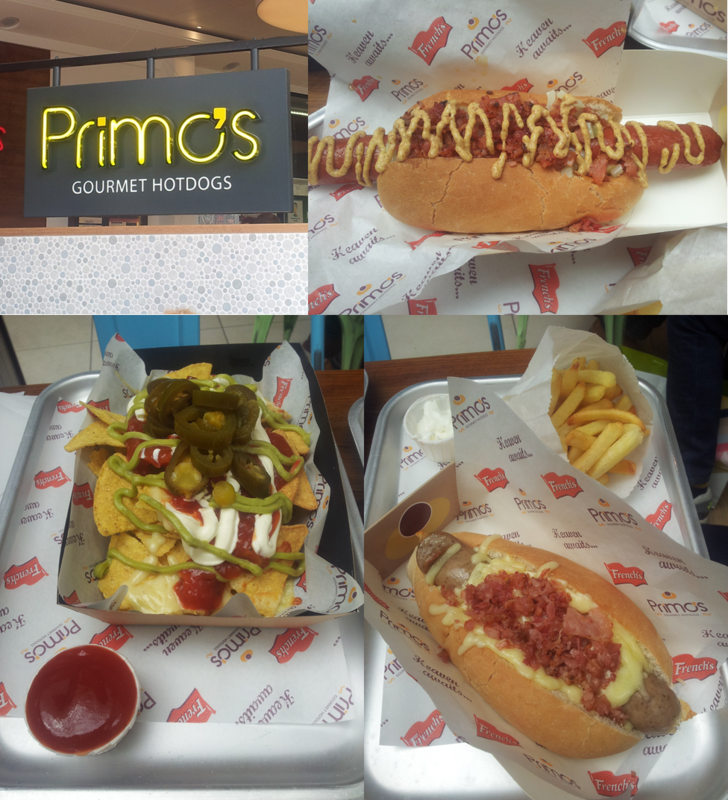 After the recent £7 million ploughed into the new food court at White Rose Shopping Centre, it’s the unassuming ‘Primo’s Gourmet Hotdogs’ that stood out amongst some well-known chains. 30 minutes later I stood staring at some of the new additions to the food court at the White Rose shopping centre. The options available included Prezzo, Wok& Go, Primo’s Gourmet Hotdogs, Bagel Nash and handmade burger Co. This felt a far cry from hanging round the Galleries shopping centre as a teenager. I remembered once being scolded in front of my mates as my gran caught me eating a meat and potato pie from Greenhalghe’s straight out the bag. I think the concept of street food would have her turning in her grave. “What do you fancy?” my wife asked, breaking into my narrative flashback…”D’ya know what, I think I just fancy a hot dog”. Primos were only established in 2010 but already feel a bit of a Leeds institution. My first visit was whilst watching the eclectic mix of presentations at Bettakultcha at the Corn exchange. It made a great first impression. Despite the humble hot dog’s associations with brine and disappointment, Primos are aiding this foods re-brand with use of proper ingredients and interesting flavour combinations. It’s fairly unassuming, just a small stand, but we had a warm welcome from the staff who were keen to tell us their favourites. I plumped for The Lynchburg, one the larger options or ‘Suprimos’ as they call it. This beef hot dog is marinated with Jack Daniel’s and honey. Unlike most hot dogs you’re used to, rather than containing the ground teeth and gastrointestinal tract of range of household pets, it was moist, meaty and moreish. The sweet marinade, bacon and chopped onions helped balance the saltiness of the meat and sharpness of French’s mustard. The onions had been gently cooked to unlock their sweetness whilst keep a decent crunch. Spot on. The bun was light and fluffy but managed to hold the substantial filling. The Utah, a bratwurst sausage, was an even tastier hot dog. It was served simply with caramelised onions, Monterey Jack cheese and crispy bacon. Whilst I wouldn’t call this gourmet, it was certainly a step beyond the humble hot dog. The fries were the only minor gripe, unlike the hot dogs they lacked the same depth of flavour. This could have been the seasoning or the fat used for cooking. We also ordered the nachos, served simply and piping hot, there was plenty of flavour here. The crunchy nachos were generously topped with a fairly mild but refreshing salsa, smooth guacamole and light sour cream. Together with the melted cheese, we quickly worked our way through. For about a fiver you can get a hot dog, fries a drink, for an extra couple of quid you can get the larger version. Decent value when compared with similarly priced offering nearby. Speaking to Jonny, the manager, it was nice to see someone genuinely proud and pleased with how well things were going. Primos are currently based at White Rose, at the Corn Exchange and at Xscape in Castleford. I’m also reliably informed they supply the hot dogs at the Fist Direct Arena too. He mentioned there’s also plans to extend the menu options to include breakfast too. For those who’ve read this blog before, you’ll know I’m a fan of anyone who sticks to doing one thing right. Here the focus is on the unpretentious hot dog which is made all the better by simple, quality ingredients, cooked with thought. At least that day me and my better half finally found something we could agree on. All that and they sell a decent cup of coffee too. Disclaimer, this was a free meal for trying out the new food court but I chose Primos based on positive past experiences.